All these things and more are reason enough to put down stakes in Yorktown but with so many wonderful neighborhoods to choose from it can be tough to decide which one is right for you. That’s why “Mr Williamsburg” writes these Neighborhood Spotlight articles to introduce readers to the pros and cons of the area’s many unique locales. Today, we’re writing about the exciting Marlbank Coveneighborhood. During my years of working in the Williamsburg/ Yorktown, Virginia area real estate market, I have many homes in a lot of area neighborhoods. Ever heard of the neighborhood, Marlbank Cove ? Chances are, probably not. This small neighborhood is nestled alongside of Wormley Creek between the adjacent Marlbank Farm neighborhood and Hornsbyville Rd near the intersection of Ft Eustis Blvd and Route 17. 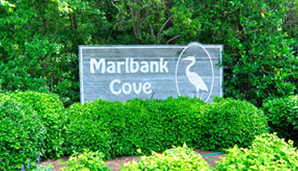 Marlbank Cove is a sought after community in the area. 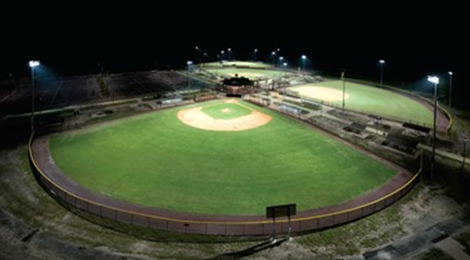 It was developed in the late 1980’s – mid 1990’s .Today, there are approximately 160 homes in the Marlbank Coveneighborhood. In terms of style, Marlbank Cove is filled with mostly traditional colonials and transitionals on lovely treed lots. Two Story homes are predominant but there are numerous ranches as well. The lot sizes for single family homes range from approximately .56 – .to over an acre with most averaging three quarters of an acre in size. Most homes were built by Ron Staples one of the areas best builders. Why is Marlbank Cove so popular? It’s simple ~ its location in Yorktown , the pool, clubhouse and community pier, top rated York County Schools, tight-knit community.and more. 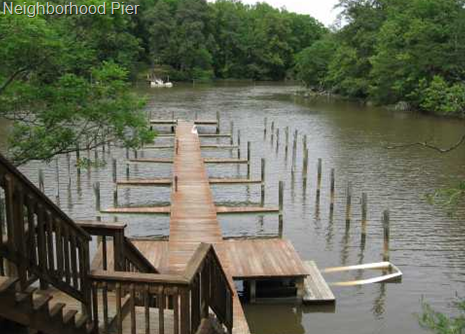 Marlbank Cove is located in Yorktown and is easily accessible to RT 17 and I-64 for a quick commute to Newport News, Ft Eustis, Langley AFB, Cheatham Annex, USCG Yorktown, Williamsburg and most other points on the Peninsula. Marlbank Cove Makes The Grade!!! Marlbank Cove students are fortunate to attend York County Schools. York County has one of the top public school systems in Virginia. Money Magazine named York County schools one of the top 100 education buys in the country. There are also eight colleges and universities and three community colleges in Hampton Roads. The region has the highest concentration of colleges and universities in the entire State of Virginia. Of the County’s adult population (25+), 92% has at least a high school diploma; 21% has at least a bachelor’s degree; and 16.4% has an advanced graduate or Professional degree. The high levels of education among County residents are reflected in the types of jobs they hold. 40% of the County’s employed residents in 2000 held professional or managerial occupations. Over the last year, home sale prices in Marlbank Cove have ranged from a low of $334,000 for a 2500 square foot home built in 1986 to $510,600 for a 4152 square foot five bedroom three bath home circa 1987. List price on the larger home was $550k . Marlbank Cove is a deed restricted community. It’s residents are diverse in background, geographic origins and nature of their present business. Marlbank Cove boasts a strong association of home owners who work together to maintain the community as a place of pride for all it’s residents. From the beginning of the planning stages the Marlbank Cove subdivision was planned as a residential neighborhood of the highest quality, setting new standards of excellence within York County, offering beautiful and well maintained surroundings, large wooded lots, residences of highest quality and architectural beauty, and superior recreational facilities including water access for its residents. Written into the covenants is the following: “The natural beauty of the land shall be protected and preserved to the greatest extent possible”. With a real estate tax of $0.6575 per $100 York County taxes are among the lowest in the Hampton Roads region. 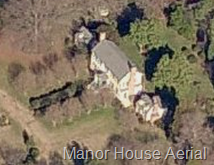 The annual taxes on a typical home in Marlbank Cove valued at $500,000 would equal $3288.00 a year. To put that in perspective the annual taxes on the same value home in neighboring Newport News would be $5500.00annually. 9.. Low HOA fees—only $42 a month. Directions: From I- 64, Take Exit 250B for VA 105 East / Ft Eustis Blvd go 3.8 miles and turn left on Rt 17 , go 3/10 mile and turn right onto Battle Rd, that will take you into the Marlbank Cove neighborhood. Talk back: Are you a current or past Marlbank Cove resident? We’d love to hear about your experiences in the neighborhood. Please leave your comments below. Do you live in Marlbank Cove and want to keep up with home prices in the neighborhood ? Lot Sizes: ..50 to .1.25 acres . Property Tax Rate: .6575 cents per $100 of assessed value. Taxes on a $500,000 home would be $3,280 a year. Who said real estate was a bad investment. 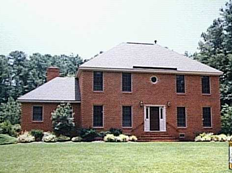 Thirteen years ago (in 1998) this 2900 square foot new home in Marlbank Cove sold for $218,000. Today that home would sell for approximately $440,000. The neighborhood lies in the center of a fascinating historical area. The first York settlers started a village on the northern-most branch of Wormley Creek, now the grounds of the U.S. Coast Guard’s Yorktown Training Center, in the 1630’s. York County, one of the original eight counties in America, was created in 1634, and Yorktown was established by the General Assembly as a tobacco port in 1691. The current Marlbank Cove and Marlbank Farms area was assembled into “Wormley Creek Plantation” by Charles Carter. It was assembled from three previous landowners, one of whom was Lawrence Smith who laid out the Town of York. In 1770 the 500-acre plantation passed from Carter’s son, David Jameson, who named it “Church Fields,” and later it was sold to Christopher Stedman who operated a mill there. The remains of the mill dam can be found today in the woods between Marlbank Cove and Old Wormley Creek Drive. On October 19, 1781, a mile or so away at the Yorktown Battlefield, the decisive victory in the American Revolution occurred, assuring American independence. The area now containing Marlbank Cove and Marlbank Farms developments saw the foraging of George Washington’s men as they searched for game and other foodstuffs during the siege. The Garretts of Williamsburg were the next owners of the plantation, which then included about 800 acres. They renamed it “Marlbanks” and in 1837 built a manor house, which still stands. Before passing the land to Tom Clark of Delaware prior to the Civil War, the Garrett family had increased the plantation’s size to 1100 acres. In the spring of 1862, the plantation, then known as “Clarks Farm”, was the base for the Union forces under General George McClellan who were establishing another siege of Yorktown, this time against Confederate forces protecting the Peninsula approaches to Richmond. Period maps of the siege show the manor house serving as a Union field hospital, and McClelland’s headquarters standing to the east, near where McClellan Court now lies. When Marlbank Cove was developed, it was very common to find artifacts of the Civil War — buttons, belt buckles, and so on. One home site has a large pit believed to have been a field “refrigeration unit”. After the Civil War, the plantation reverted by default back to the Garrett family. It was sold to William Hughes in 1879, who sold 550 acres to L. R. O’Hara in 1945. Mr. O’Hara restored the manor house, named Marlbank Farm, and developed Marlbank Farms subdivision beginning in the late 1940’s. The O’Hara’s or their descendants lived in the house until 1988. When the manor house was sold and refurbished in 1988, more homes were built in its immediate vicinity. Marlbank Cove subdivision began in 1985 and occupies part of the original plantation area. 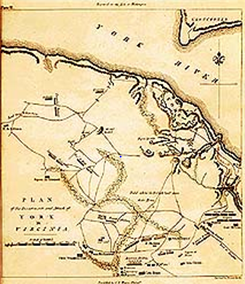 The term ‘marlbank’ refers to the layer of marl (a conglomerate of mud, shells and clay) that lies below the soil surface along the York River. Early settlers at Yorktown used marl as construction material, as can be seen today at Grace Church in Yorktown village, built in 1697. In May 1862 Yorktown again found itself surrounded by armies locked in combat. The area around Marlbank Cove saw a great deal of military activity as a result. 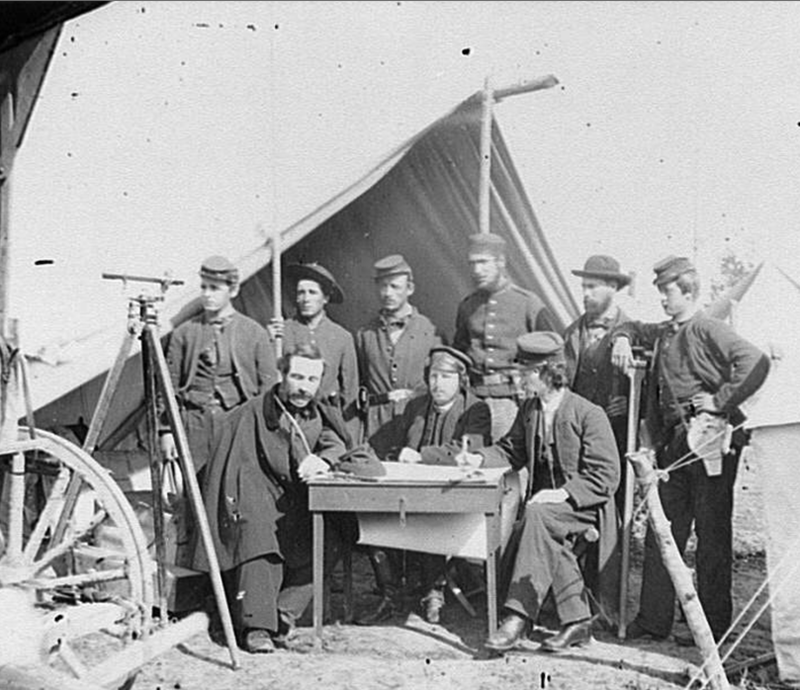 Below are several photographs taken in the May 1862 time frame. Union forces led by General George McClelland and advancing from the vicinity of Fort Monroe (which never fell into Confederate hands and therefore served as a Union foothold and staging ground for campaigns against Richmond throughout the Civil War) encountered Confederate forces, led first by General John Magruder and then Joseph E. Johnston, who manned a line of defenses spanning from the James-Warwick River confluence near today’s Fort Eustis to the York River, with concentrated forces around Yorktown. The Southern troops utilized many of the same embankments first dug by British forces during the Revolutionary War. Evidence of the Confederate works, especially shallow, long-running communications trenches, can be found in the woods of the National Park and running into Newport News Park. A period map shows the location of Gen McClelland’s tent as being in the immediate area of Marlbank Cove, very close to where McClelland Court lies (the actual site appears closer to the intersection of Marlbank Drive and Three Point Court). The picture to the left shows a close-up of McClelland’s tent, as well as a broader view of the encampment, which was named Camp Winfield Scott.